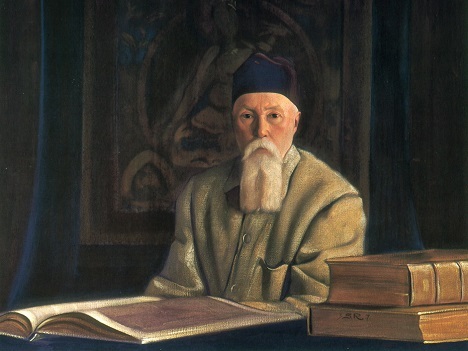 A painting of Nicholas Roerich by his son Svetoslav. The personal office of Nicholas Roerich will be re-created in the museum as well as an art studio and a platform for public debates on the preservation of cultural heritage has been organized. The Ministry of Culture, at a board meeting, has approved of the concept of development of the Roerich Family Museum, which will become a branch of the Museum of the East. "Main purpose of creation of the Roerich Family Museum, based on the Museum of the East is creation of a museum of modern education, of a scientific and educational center of the international level pertinent to the historical significance of the Russian artist and his family", said Alexander Sedov, director of the Museum of the East. He noted that "one of the largest collections of the Roerich family in Russia has been formed at the State Museum of the East. Works of artists from Roerich's circle, as well as an archive of artist's family complement it. In total, the collection has over 440 works of Svetoslav Roerich and objects of decorative and applied arts", said Sedov. According to him, the personal office of Nicholas Roerich will be re-created in the museum as well as an art studio and a platform for public debates on the preservation of cultural heritage has been organized. Roerich belongs to the famous dynasty of Russian artists, philosophers and scientists. The Roerich Family, in the 20-ies of the last century, linked their lives with India. Its founder Nicholas Roerich created about 7000 paintings, many of which are present in well-known galleries of the world, including in Russia and in India. He has authored about 30 literary works. His wife Elena Roerich is widely known as the creator of the philosophical system "Living Ethics'. Their son Yuri is known as an outstanding researcher of Central Asia and is author of a multi-volume Tibetan-English-Russian-Sanskrit dictionary; another son Svetoslav is an outstanding artist. In India, in the Kullu valley, where the house of the Roerichs is located, the International Roerich Memorial Trust holds annual events related to the study and promotion of heritage of the Roerich family.